$0.50 Goldfish at Price Chopper Starting Sunday! 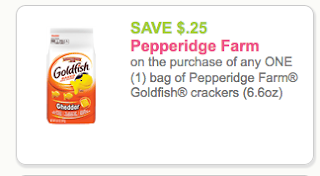 $0.25/1 Pepperidge Farm Goldfish - Starting Sunday Pepperidge Farm Goldfish will be on sale for $1 at Price Chopper (part of buy 10 get $0.10 of per gallon promo) = only $0.50 each! Doesn't PC accept competitors coupon?